The Sapphire collection is Oliveti Cubicles most comprehensive, economic and popular range, combining aesthetics with quality, durability and reliability. It is an extremely versatile system, suitable for all environments including schools, offices and leisure facilities. Combining a wide selection of performance finishes (MFC,CGL and HPL) with both standard and security fixing options. The hardware for these cubicles can be used with either 12-13mm or 19-21mm panels and is designed to suit all environmental conditions. 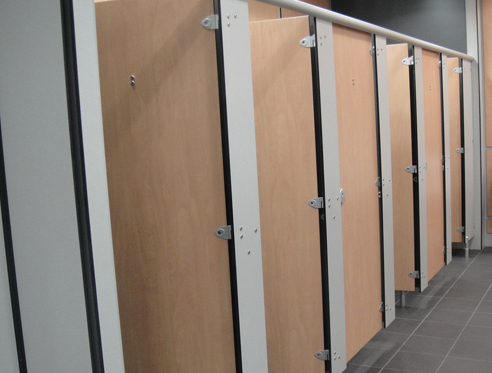 The complete Sapphire Cubicles range is manufactured from non-corrosive stainless steel and brass, making them strong and durable for a trouble free and long lifespan. Vandal resistant indicator bolt complete with hidden fixings and smooth rattle free movement. A complete range with well designed matching partition supports, brackets, hinges and indicator bolt. Suitable for the majority of standard panel sizes and specifications. Manufactured from non-corrosive materials to increase the lifespan of the cubicle. Optional Sapphire security fixings available for cubicles in aggressive environments. Supplied with fixing instructions and technical information for easy installation. Sapphire hardware is available in a wide selection of finishes, colour matched if required. Choice of indicator bolt faceplates. All fittings feature countersunk fixings for a flush finish. The attractive partition supports are strong and fully adjustable for sloping or uneven floors and features an easy to fit foot block with fixings to reduce the time spent on-site. A wide selection of headrail sections are available to compliment the unique design of the Sapphire hardware. All headrails can be finished to match the hardware. Ultra modern brackets with a unique shape and emboss are supplied with flush fitting countersunk fixings.The attractive brackets are suitable for walls and fascias and come with the choice of fixings for varying panel specifications. Angle brackets for post formed fascias or end pilasters are also available. The "Anti-Vandal" indicator bolt comes with hidden fixings as standard. It has been designed with safety and security in mind. The user friendly handle makes operation easy for both children and the elderly. Its unique design ensures a smooth, rattle free slide action, effortlessly, everytime. The indicator bolt is suitable for outward opening disabled cubicles as it is fitted with a slot release mechanism to allow access in the event of an emergency. The bolt is available with either a Sapphire or simple round faceplate - the choice is yours. The durable wrap around hinge, features a fall open or self closing cammed system, which is suitable for both left and right hand opening doors.The nylon hinge riser ensure the door opens and closes smoothly and quietly.